Hear it from people who've worked with us. We're change agents, we're all about results, and we don't leave our clients' sides until the job's done right. Instead of telling you, let us show you. Read about real SRi clients and their experiences in the case studies below. A client in the SaaS space increased revenue by 75% in 12 months by diversifying their customer base, improving their messaging, and integrating a sales process. A supplier of home goods was struggling during a recession. With the help of SRi, they emerged stronger than ever. Revenue growth, improved operations, and sales + marketing alignment were key benefits a that a software provider experienced after bringing SRi on board. A young e-security company was experiencing extreme growing pains, rendering them unable to reach their goals. After 18 months with SRi, they became #1 in their space. 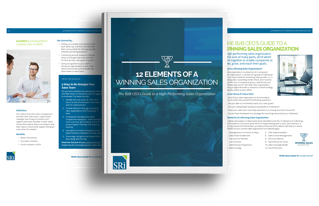 A software developer increased revenue by 30% in under 12 months by defining standards of sales excellence and implementing a sales playbook and training program. Positioned for growth but needing a plan, a financial services company brought SRi on board. Within 1 year, they built a sales team and grew into a second market. Four stories about clients' experiences with Paint-the-Picture playbooks and Winning Sales Processes, and the impact it had on their sales teams.